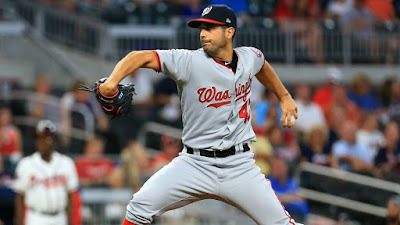 Gio Gonzalez with the Washington Nationals. The Yankees have announced the signing of two-time All-Star LHP Gio Gonzalez to a minor league contract with an invitation to Major League spring training in the hopes that he can give them depth in their starting rotation. Once it was determined that Luis Severino and CC Sabathia would start the regular season on the injured list, the Yankees knew they needed to add an arm, and Gonzalez is more of a sure thing than Luis Cessa or Jonathan Loaisiga. The Yankees rotation will likely go as follows: Masahiro Tanaka, J.A. Happ, James Paxton, Gonzalez, and then Cessa or Loaisiga or the use of an "opener" such as Chad Green, who came up with the Yankees as a starter in 2016. Gonzalez, 33, combined to go 10-11 with a 4.21 ERA (171.0IP, 167H, 84R/80ER, 80BB, 148K, 17HR) in 32 starts with the Washington Nationals and Milwaukee Brewers in 2018. The Hialeah, Fla., native began the season with the Nationals before being traded to the Brewers along with international bonus pool money on August 31, 2018, in exchange for 1B/C K.J. Harrison and INF Gilbert Lara. In five starts for Milwaukee, Gonzalez went 3-0 with a 2.13 ERA (25.1IP, 6ER) and 22K to help lead the Brewers to their first division title and postseason berth since 2011. In 313 games (307 starts) across parts of 11 Major League seasons with the Oakland Athletics (2008-11), Nationals (2012-18) and Brewers (2018), he is 127-97 with a 3.69 ERA (1,814.0IP, 744ER). He ranks fifth among all pitchers with 283 starts this decade (since 2010). Following his first All-Star nod with Oakland in 2011, Gonzalez finished third in NL Cy Young Award voting with Washington in 2012 after leading the Majors with a career-high 21 wins (21-8, 2.89 ERA in 32 starts). In 2017, he placed sixth in NL Cy Young Award voting, going 15-9 with a 2.96 ERA in 32 starts with the Nationals. Gonzalez, who will wear uniform No. 43 for the Yankees, was originally selected by the Chicago White Sox in the first round (38th overall) of the 2004 First-Year Player Draft.